Nayana Kumari, a talented actress, who excels herself in any role or character is indeed very fortunate in having the encouragement of her family members and the early guidance and advice of her Guru Gamini de Silva who was instrumental in making her what she is today. "Gamini Sir was there when I was following a course on drama and realized my potential". I was the youngest student among the 40 to follow this course and he spotted my talents and offered main roles in his stage dramas produced later", says Nayana. This was the beginning of her acting career and at the age of 14, she performed the main characters in Shakespeares Otthelo and Macbeth followed by Anton Chekovs Porisadaya and Parastawa, also by Gamini de Silva. 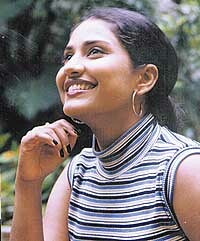 Later she appeared in the mini screen performing in the Sankramaya teledrama. "I did not have much liking for teledramas as I concentrated more on developing my talents through stage dramas and studying them", says Nayana. After a short break in this field I acted in Wijaya Dharma Sris Kastirama teledrama. I believe I was remembered by fans for my acting in Ira Handa Yata. Thereafter I participated in many teledramas including Ran Masu Del, Weli Sulanga, Sathyangani, Aluth Irak, Sanda Amawakai, Gajaman Nona, Neitranjalee and Aseni Wesi. I enjoy characters where I could perform creative roles like in Gajaman Nona and Asani Wesi, says Nayana. "My entry into the world of arts was mainly due to my mothers keenness on arts and the support of both my parents and my three sisters", says Nayana. As I was encouraged to pursue my desire to study drama, I followed the course with dedication concerned in excelling as an actress of quality later. Of course now Nayanas vision of becoming a talented actress has been proved and the many calls for her services by producers proves this. There are a few films to her credit, Nayana says she acted in Salelu Warama a film by Wasantha Obeysekara where she performed with great satisfaction. I like performing, specially the characters that are considered difficult to perform, says Nayana. One of her best remembered characters she says is her role in the tele drama "Ratreeya" which is to be telecast shortly," she said. Her life evolves around performing. Whenever she gets free time, she likes to be at home relaxing in her beautifully laid garden and welcoming her friends and relations who are reduced to stay longer to enjoy her tastefully prepared dishes. "I have not yet fixed a date for my marriage. My intention is to have a simple wedding ceremony and this does not need much planning. So whenever I get a break in between my acting assignments, it will happen, and will be towards the end of this year, Nayana says. Her life partner, Sumith Galkandaarachchi who has been sharing her joys and sorrows for over eight years has always been a source of great encouragement to me in my career. When asked about her plans after marriage, she said that she will try strike a balance between the two but prominence will be given to her family life. "Any request from Sumith from me to quit acting and I will gladly do so," said Nayana. Today, the tele drama industry has gone a long way. It is a better medium to reach a larger audience fast. We must make use of this in educating people while providing entertainment. The producers should be responsible for conveying positive massages to the viewers, Nayana says. Nayana who has won the admiration of her fans for her brilliant acting is a citizen and an artist with a conscience desirous of contributing her share to help produce a better society here. Friendly, talented and young Nayana likes a bright future prospect in our world of art.